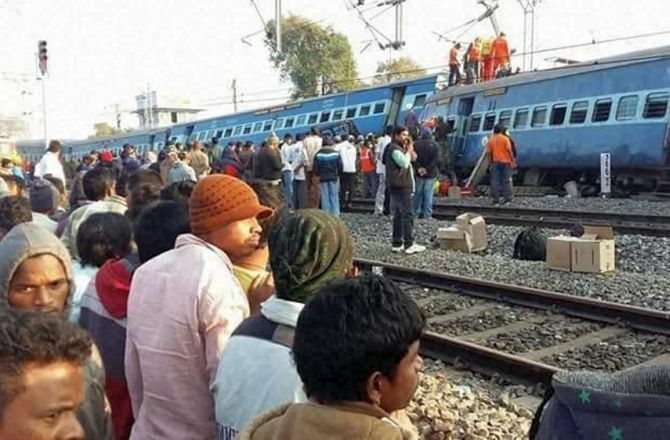 A National Investigation Agency team on Monday inspected the accident site of Jagdalpur-Bhubaneswar Hirakhand Express in Vizianagaram, in which 39 people lost their lives on Saturday, to ascertain if it was a terror act as the Railways has suspected sabotage. Official sources said the team is looking into whether there was a terror angle involved or the accident was due to technical or human error. It was just an examination of the accident site to draw preliminary inferences whether the case can be taken up by the NIA, they said. With the Railways suspecting sabotage, the Union home ministry was exploring the option of handing over the investigations to the NIA, which is nodal agency to probe terror-related cases. The NIA is also looking into the claims of three persons, arrested from Bihar, that derailment of Indore-Patna train on November 20 last year, in which 150 people lost their lives, was caused due to sabotage by Pakistan’s Inter-Services Intelligence. The probe agency, however, had ‘so far’ found no evidence or input to this effect during its probe. Uttar Pradesh Police has also rubbished the claims of any sabotage in the Railway accident. Moti Paswan, Uma Shankar and Mukesh Yadav, arrested last week from East Champaran district of Bihar, had claimed that they have received Rs 3 lakh to plant improvised explosive devices at Ghorasahan railway station in the district on October 1 last year. Bihar Police had reportedly recovered the IEDs. A team of NIA officials has already gone to Bihar to question the accused and verify their claim. The trio had reportedly ‘confessed’ to the possible role of ISI in the last year’s derailment. They also claimed to be working for the ISI, the sources said. Odisha Police, however, ruled out involvement of Naxals in the Hirakhand mishap. “There is no indication of Maoist’s hand behind the derailment,” Odisha Director General of Police K B Singh had said. Meanwhile, bodies of all the 39 passengers have been identified by the Railway officials. According to a list provided by the Railway Divisional Manager’s office in Visakhapatnam on Monday evening, 39 passengers were killed and 69 injured in the accident. The train was proceeding to Bhubaneswar. The deceased are: Saied Damin, 10; Kareena Devi, 16; Ranjan Nayak, 18; M Krishna, 35; Kartik Sahu, 27; Pathuva Pillai, 21; B Neela Madhava Patro, 26; Dilip Kumar Routh, 51; Subhash Chandra Sahoo, 60; Subhashini Panda, 60; Viswanath Damini, 20; Subha Bhatti Sahu, 44; B Kamala, 50; Yella Krishna Murthy, 70; Salem Renuka, 50; Pradeep Kumar Minj, 45; Gayatri Sahu, 14; Somu Annamma, 50; Vishnu Prasad Sahu, 58; R N Mansinghji, 27; P Polisetty, 35; Josodha Pandit, 45; Ram Prasad Pandit, 55; K Revathi, 16; Mondal Balram, 50; Tapan Kumar Pradahn, 26; Rajkishore Padi, 48; Sushant Kumar Swain, 40; Ashok Kumar Biswal, 35; Thellu, 8; Rohit Kumar Pradhan, 50; Kulo Devi Damin, 60; K Ravi Kumar, 20; Bebudhar Bhoi, 57; Sahok Mahji, 19; Padmini Harijan, 22; Ramana Devi, 20; Chennu, 11; and Harishankar Majhi, 22. Meanwhile, the train movement on the Rayagada-Vizanagaram section of the East Coast Railway, disrupted due to the derailment, has normalised, Additional Divisional Railway Manager Ajay Arora said. The affected tracks were restored at 4 on Monday morning, leading to movement of trains on the section, he said. Will the railways change to safer LHB coaches? Who will decide Rail fares from next year?